Miracles are associated with this Church. One miracle story concerns a group of Fishermen, who, soon after setting off on a fishing trip around the islands, hit a reef or submerged rock. Their ship is holed and begins to sink. They huddle together on the deck and pray to the Virgin. Miraculously the ship stops taking on water, and they manage to get the vessel safely to shore with no loss of life. When the boat is hauled out of the water, they find to their amazement that a very large fish is wedged in the hole, and it is this which has prevented the boat from sinking. The story was mentioned in Francesco da Mosto's TV documentary "Mediterranean Voyage". 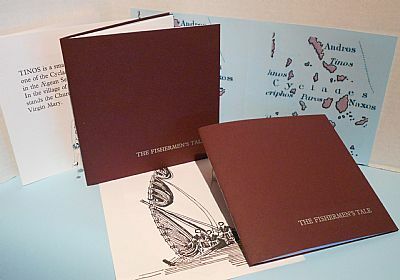 We have produced a booklet of the story, letterpress printed in 24pt Plantin. The illustrations are by Frances Grant who also designed the booklet. Finally finished! See Handmade books for details.